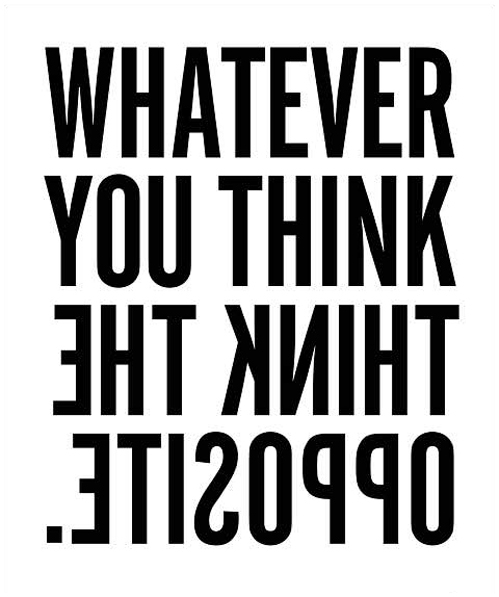 … STOP and think the opposite. Simple enough, right? But we NEVER think to do it. As Patanjali says in the Yoga Sutra, “Vitarka Badhane Pratipaksha Bhavanam” – when disturbed by disturbing thoughts, stop and think the opposite. Everything is energy and where you put your energy is what you will get MORE of so it stands to reason that dwelling in negativity will NEVER bring about the positive outcome you desire. Buying into a thought makes it REAL for you. So, if you do not want that thought in your life, DO NOT give it any attention. Simple as that. Thoughts are what create our reality. If you focus on what is upsetting you, you will only continue to perpetuate the upset. If you can learn to cultivate the opposite, you can create a much better reality for yourself as your thoughts always set you up for your next experience. Life is a game and you are in control of your next move. Life is too short to perpetuate situations that do not work for you. So when disturbed by disturbing thoughts, stop and think the opposite. When you change the way you look at things, the things you look at will naturally change. A lifetime of happy thoughts and experiences await you. What are you waiting for? Thank you for this and the zen blog info too. Sacred Centers - Anodea Judith's center. Take a look at the programs.